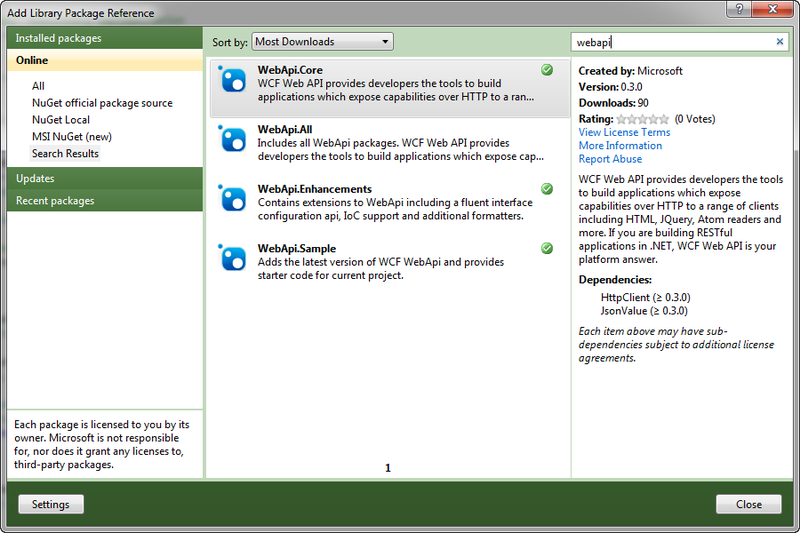 When you download the latest Web API bits, there are a couple of sample applications that show off the latest features of the Web API (these are in the CodePlex download, not the NuGet packages). The first one is a Contact Manager "Simple" project which is intended to show just how simple it is to consume the Web API framework. There is also another sample which shows the advanced features such as IoC support, custom media type formatters, channels, and more. I like to create a lot of "Hello World" applications when I'm learning a new technology for the first time or even when I just want to do some quick tests for a technology I already know pretty well. The existing Web API NuGet packages certainly help us add the references quickly. However, there is an even quicker way to get up and running with the new Web API – sample NuGet packages. Since NuGet has such rich functionality beyond adding references such as adding start code and configuration, there are many packages that exist to get you up and running fast. David Ebbo highlighted this last month in his post: Take NuGet to the next level with sample packages. // TODO: Use Visual Studio refactoring to rename "MyModelType" to your desired type. //       Then you can move the model to its own file. There are several things to note about this code. First, I'm just using a static Dictionary for temporary storage. This can be replaced with your "real" repository of choice. The Get() method returns an HttpResponseMessage which is the strongly typed HTTP message available in the Web API. You can see that if the id is not found, we're able to throw an HttpResponseException which is a much more intuitive way of dealing with exceptions than what we have today. I'm also able to set expiration headers – all without referring to the static WebOperationContext. The other methods are similarly easy to work with. It's important to point out that this is not a RESTful service – this is merely a CRUD service over HTTP. Although I do set the location header in the Post() method, I'm not leveraging hypermedia and therefore, not RESTful. A logical next step would be to create a NuGet sample package that contains starter code for more advanced features such as IoC, media type formatters, etc. The Web API is getting better and better. It's now easier and simpler than ever to work with HTTP. Now is the time to start getting familiar with it and provide your feedback to the team.